PE wood plastic profiles (two-step) extrusion production line | Silver Python Machinery Co., Ltd.
SMYF series of wood plastic profiles extrusion line is a special design of the screw, barrel, mold and our company’s original wood plastic technology and formula, and can be configured with the corresponding vacuum stereotypes, sawing machine, rolling platform and other auxiliary equipment. It is a new environmentally friendly products, plastic and waste wood fiber by a certain percentage of plastic processing aids, made of wood-plastic composite materials, by high temperature, high pressure extrusion. 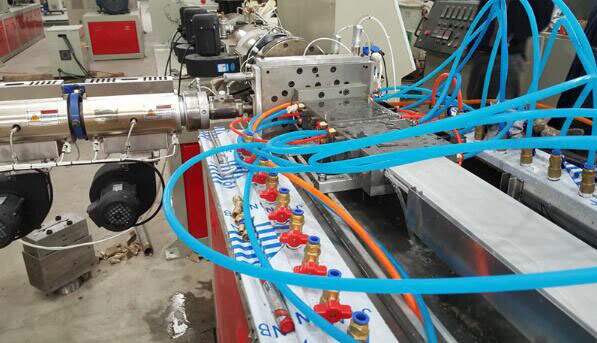 The current two-step wood plastic profiles extruder line method is more widely used, usually with a cone double extruder or flat twin extruder granulation, and then double or single screw extruder extrusion molding products, mainly used in indoor and outdoor floor, fence, tray Such as PE class of wood-plastic products extrusion molding. the operation of a single, the overall technical requirements of the production staff is low, supporting mold and extrusion equipment requirements relative to one step method is lower. PP, PE + wood powder. The wood plastic profiles extruder production line is mainly used for production garden landscap, logistics and other outdoor wood plastic profile extrusion. The production line to replace the extrusion mould die, can also produce a two PE wood-plastic profiles, greatly improve production capacity. Increase the co-extrusion extruder, can produce co-extruded PE wood-plastic products.It has been proved that a special co-extruded material covering the surface of the product ,can effectively improve the anti-ultraviolet and anti-oxidation function of PE wood and plastic products and deformation, greatly improving the PE wood plastic profile life. Co-extrusion profiles are made by means of a small single-screw extruder and a wood-plastic host, which is uniformly and firmly coated with a coextruded layer. The use of this new technology to produce coextruded wood, in addition to retaining the traditional plastic wood mold, pest control and other physical performance advantages, but also has a stronger wear resistance, scratch resistance, anti-fouling and weathering performance, more beautiful and durable. The biggest difference between the appearance of the co-extruded floor is that it is a layer of wood plastic protective layer than the general product, it is because of the existence of protective layer, which greatly improve product life. Application: suitable for high-end outdoor landscape works.